When Is the Right Time to Feed Hummingbirds? Offering a consistent source of nectar is the ideal way to attract hummingbirds, but when should birders put out hummingbird feeders so the birds can enjoy the treat? There are several factors that affect the best time to start feeding hummingbirds in different areas. 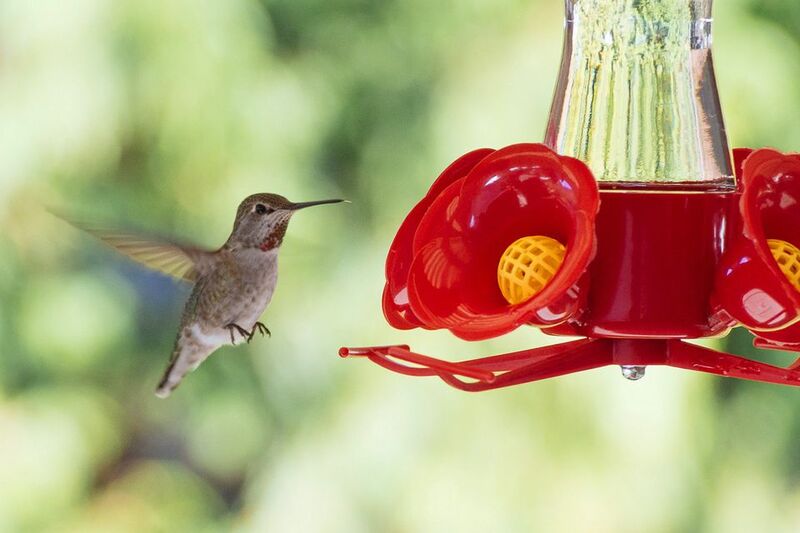 Understanding those factors and other local considerations can help you decide when to put out your hummingbird feeders so no nectar is wasted and no hummingbird goes hungry. Location: Some southern and coastal regions of the United States and Mexico, as well as much of the Caribbean and South America, are home to hungry hummingbirds year-round. In those areas, there is no best time to start feeding hummingbirds, and anytime is a good time to put out nectar feeders. In other regions, the best time to put out hummingbird feeders depends on the season and local hummingbird populations. Climate: Mild climates and warmer areas are attractive to hummingbirds in early spring. In those areas, it is best to start feeding hummingbirds earlier so they always have a good nectar source to visit. In areas with cooler temperatures and later springs, hummingbird feeders can be kept in storage longer without depriving the birds of a good meal. Both geographical location and elevation can affect climate enough to determine the best time to put out hummingbird feeders. Migration: Learning when hummingbirds migrate is a great way to decide when to put out hummingbird feeders. If the birds are on the move, they will need good nectar sources for refueling and will readily visit clean, fresh feeders. For early migrants, the presence of a reliable feeder can make the difference for a successful migration when flowers aren't yet in full bloom or not having enough food to complete the migration. While the exact dates to put out hummingbird feeders can vary, these birds do tend to be reliable in their migration patterns and when they start visiting feeders. Year-Round Feeding: Offer hummingbird feeders all year long in areas where these birds are non-migratory or where overwintering hummingbirds join residents during the winter months. Birders along the Pacific coast of the United States and southern British Columbia can feed hummers all year. The Rio Grande Valley area of south Texas and along the southern Texas coast, southern and central Florida, and southeastern Arizona are also year-round hummingbird hotspots. In the Caribbean and Central and South America where many hummingbirds do not migrate, year-round feeding is also ideal. February / March: Hummingbird migration begins early in the southern United States. Areas in the deep south, including northern Florida and southern Georgia, can put out hummingbird feeders as soon as mid- to late February or very early March and expect to be visited by the first arriving migrants. March / April: Early migrating hummingbirds that are heading to breeding grounds further north begin appearing in the central United States as early as mid- to late March and early April. Ruby-throated hummingbirds and rufous hummingbirds will appreciate feeders up early in these regions. April / May: Hummingbirds begin to reach their northern ranges in late April or early May. It is best if all birders have their hummingbird feeders cleaned, refilled, and ready for thirsty guests no later than the first week of May. May / June: In the furthest northern reaches of hummingbird ranges, the birds do not arrive until later in spring or very early summer. In the central Canadian range of the calliope hummingbird or the Alaskan territory of the rufous hummingbird, waiting until mid-May or very early June to put out hummingbird feeders isn't necessarily too late. Birders should always be on the lookout for earlier arrivals, however, and get the feeders ready to serve them. Hummingbirds, like most migrant birds, can be very predictable with their arrival and departure dates. While there may be a few days' variation from year to year, learning when these birds migrate is the best way to judge when to get those nectar feeders ready. The best rule of thumb for when to start feeding hummingbirds is this: It is better to put out hummingbird feeders too early rather than too late. Do not wait until the first hummingbirds have been seen before getting feeders ready, as this will likely be too late to attract the earliest migrants. These birds have amazing geographical memories for reliable food sources, and once they find your feeders they will continue to visit year after year. If the feeders are missing, the birds are likely to move on to another option, and they may not readily return to an unpredictable food source. At worst, putting out feeders too early may mean taking steps to keep the nectar from freezing during a late winter or early spring cold snap or replacing old, spoiled nectar once or twice before the birds arrive. Those are very small inconveniences for the joy of welcoming these flying jewels back at the first opportunity every spring.